It was nice to cook something for them since I’ve grown up around their cooking. My Nana makes a mean Yorkshire pudding and taught me to make crepes and my Papa can cook an egg perfectly any which way and taught me to make cream puffs. Their culinary talents don’t end there, but those are some of my favorite dishes to associate with them. I have two truly talented grandparents. And gosh, watching my Papa banish us from the kitchen so he can do everything himself is like looking in a mirror. Sorry, Papa, but it’s true. And I understand it completely. I’m a total kitchen control freak. Another factor that contributed to my interest in cooking was my college experience. I went to a wonderful school – Sewanee: The University of the South. The classes, professors, campus, fellow students – everything was great. Due to the rural location of Sewanee, most of us lived in dorms all four years. That was also great, in some ways. We didn’t have to worry about paying bills or building upkeep. But that also meant a meal plan for all four years. By spring semester of my junior year I had begun watching cooking shows on YouTube just to dream about home-cooked, delicious meals. I would talk to my mom and ask, “What are you making for dinner tonight?” It was self-inflicted torture. I’m not saying our dining hall was gross, by any means…but after two and a half years and a budding interest in the culinary arts, I was quite literally starving for good food. I specifically remember watching Ina Garten’s video for this dish in my junior dorm room, salivating. 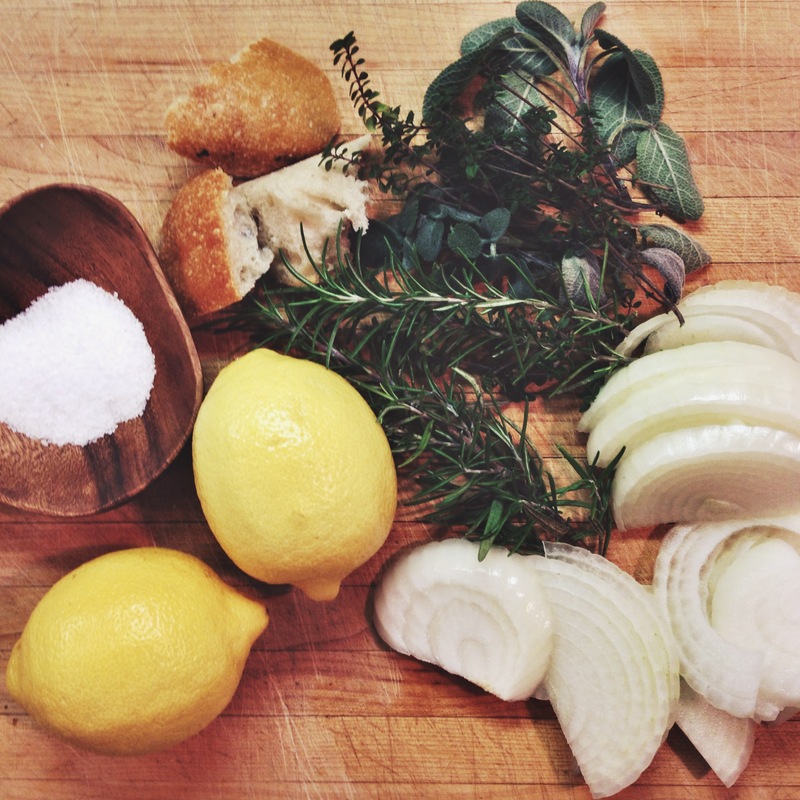 Since then, Ina’s Lemon Chicken with Croutons has become one of my staples for entertaining or cooking a casual meal for my family and friends. I, like Ina and Jeffrey, believe that roast chicken is one of the best, most satisfying meals out there. And they’re so simple to prepare! Buy a chicken, throw some butter or oil on there, stuff it with either a lot of delicious ingredients, or just a few, and then throw it in the oven for a while. 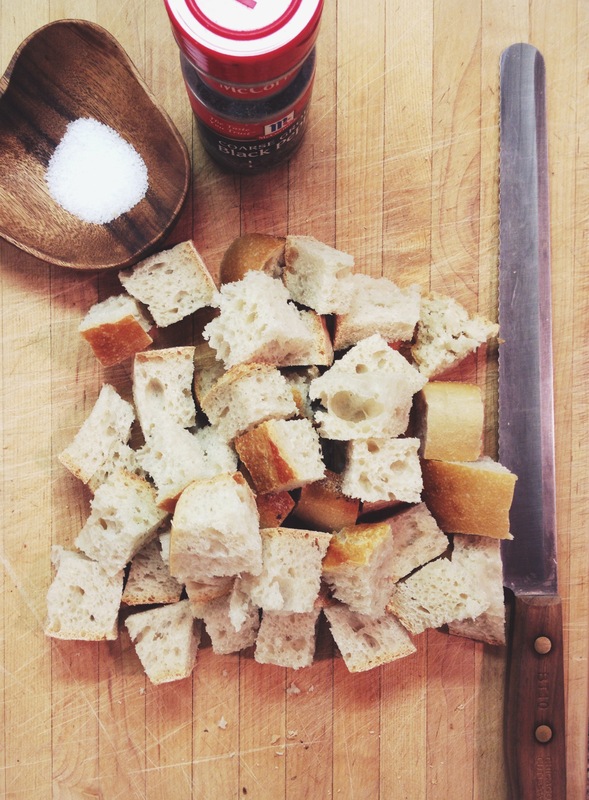 This particular recipe steps it up by serving it over slightly crispy homemade croutons to soak up all of the lovely drippings. 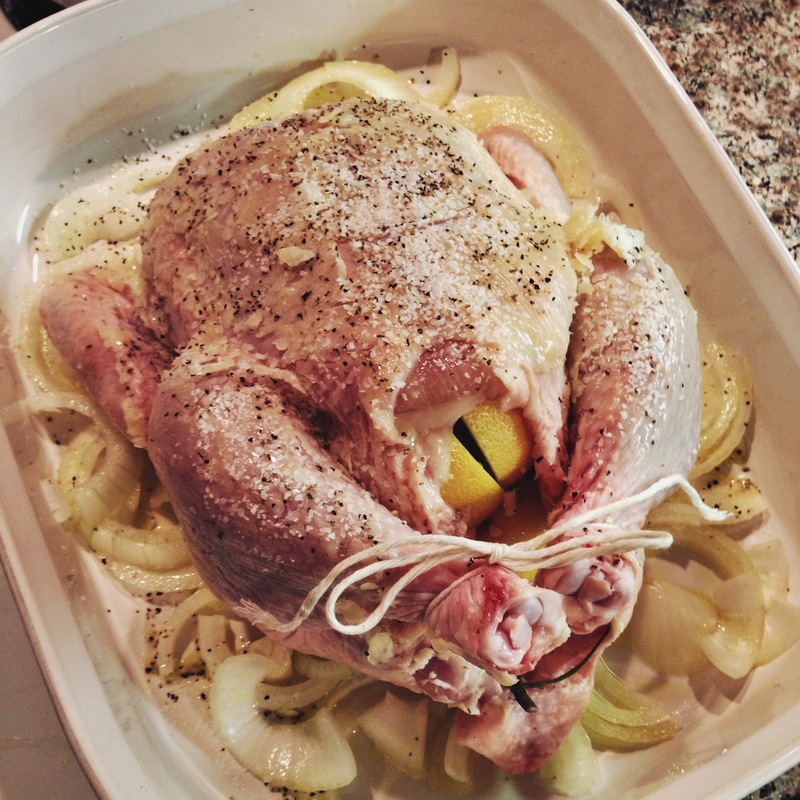 Usually I don’t change a thing about this recipe but this time I added a few sprigs of rosemary, thyme, and sage to the cavity of the chicken because it was fresh and in the garden, so why not? Another plus for chicken – it’s very adaptable. Something I might try next time is parboiling (which probably means microwave, let’s be honest) the lemons. 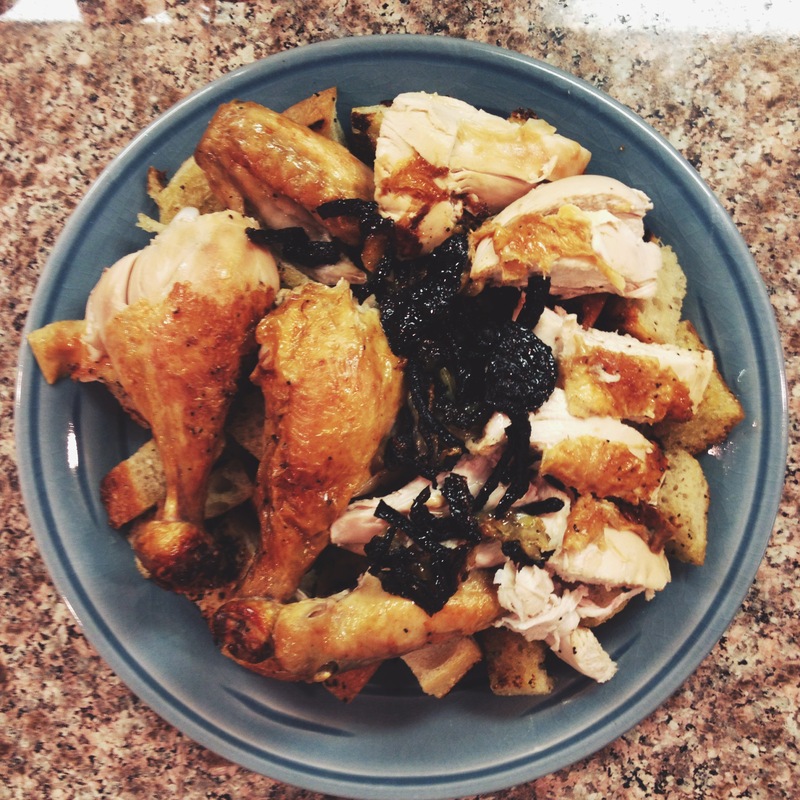 In Jamie Oliver’s recipe, which I linked earlier, he does this and his chicken is super moist and flavorful. Ina’s is too, but it would be interesting to see if there really was a difference. If you want to follow her recipe completely though, it’s perfect. I highly recommend it. She uses butter because the milk solids burn a little bit while cooking and really give the skin that great flavor and crispness that I love so much. You can use oil if you’d like though. This chicken cooks surprisingly quickly, so keep your eye on it. This time it cooked in about 50-55 minutes. 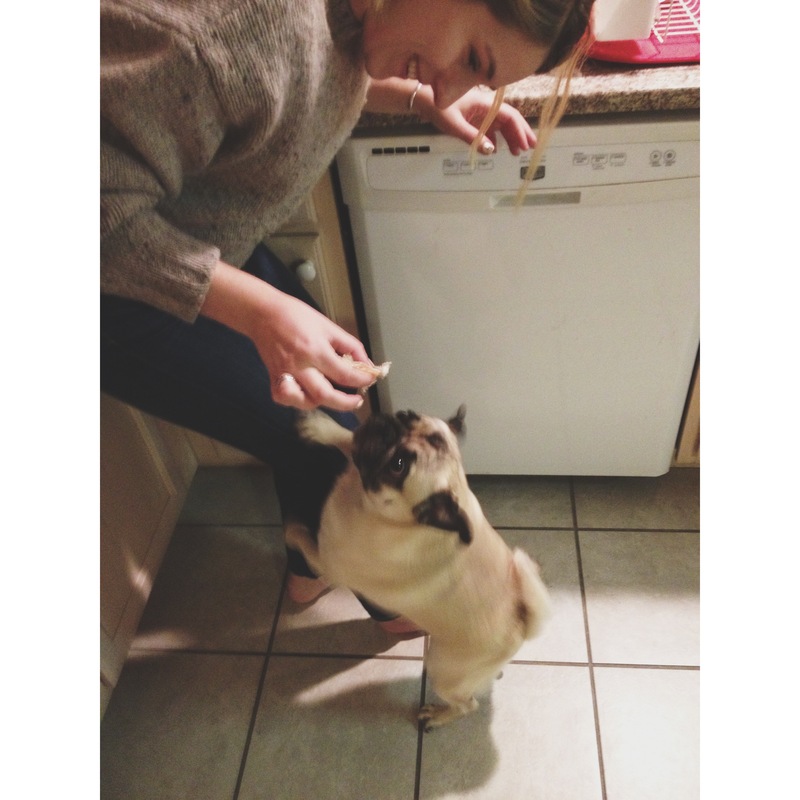 By the way, my grandparents’ pug Menzie also thought this chicken was a big hit. 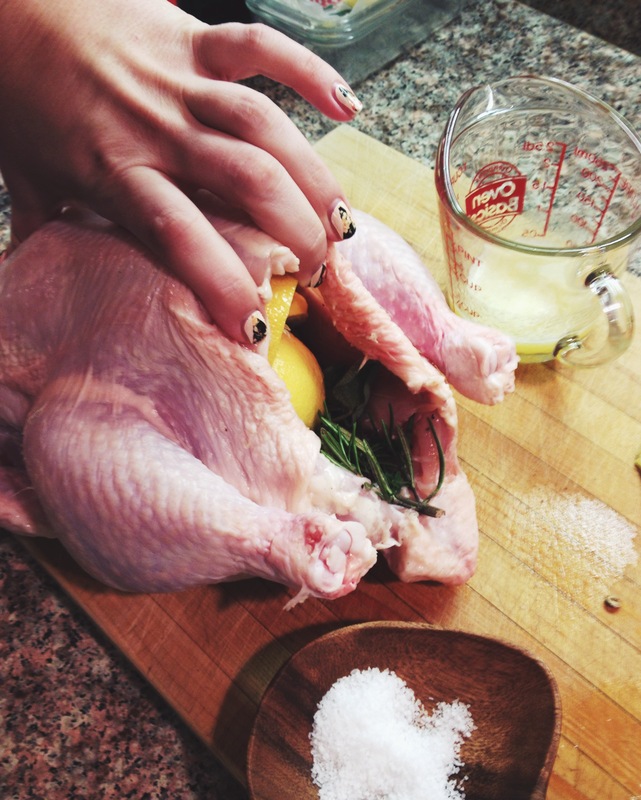 Take the giblets out of the chicken before rinsing it inside and out. Pat the chicken dry on a clean work surface. Toss the onion slices with a little olive oil in a small roasting pan. 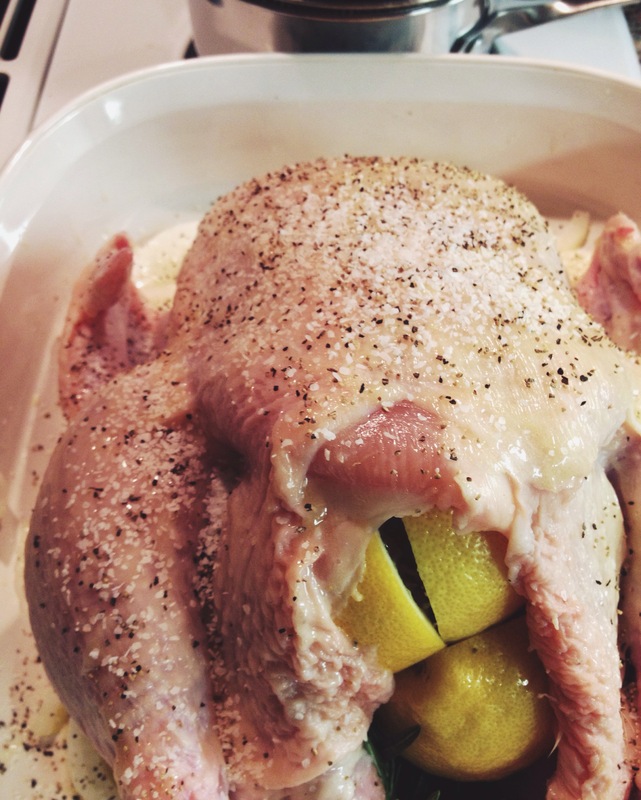 Sprinkle the inside of the chicken with salt and pepper, then place the lemons (and herbs if using) inside. 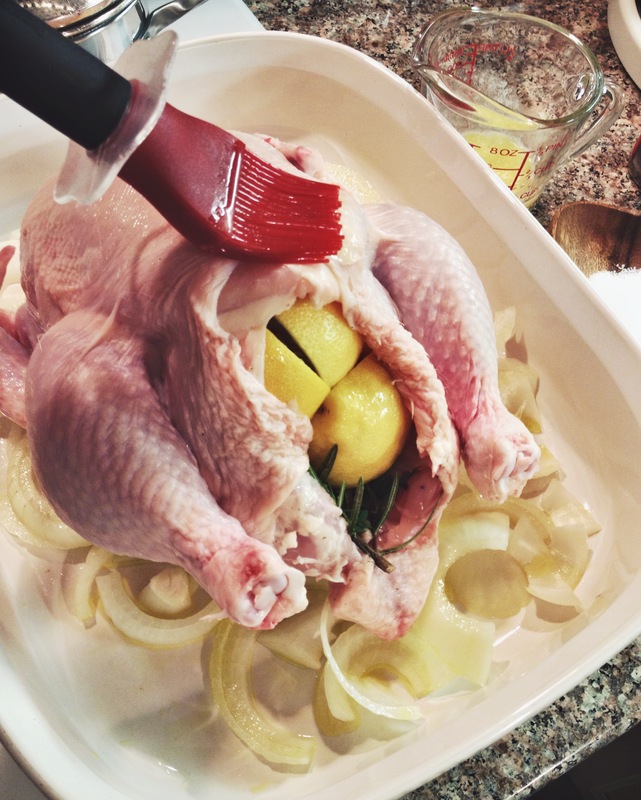 Place the chicken on top of the onions in the roasting pan so that the legs and breasts are facing up. 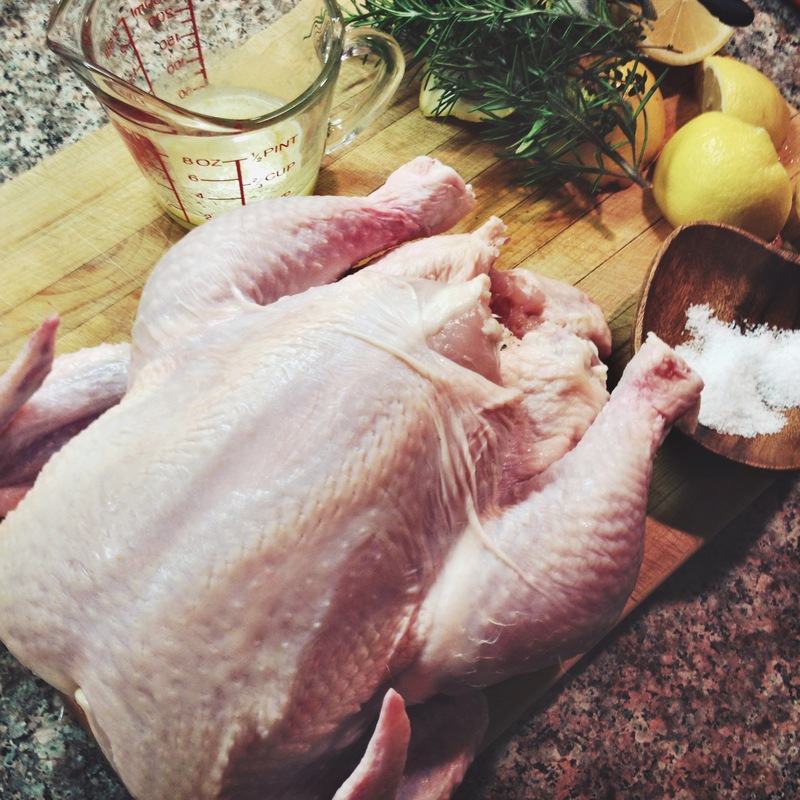 Brush the chicken with the melted butter and sprinkle with salt and pepper. Using kitchen twine, tie the legs together. *If you want to, you can also tuck the wing tips under the body of the chicken. While the chicken is resting, heat a large sauté pan with about 2 tablespoons of olive oil. 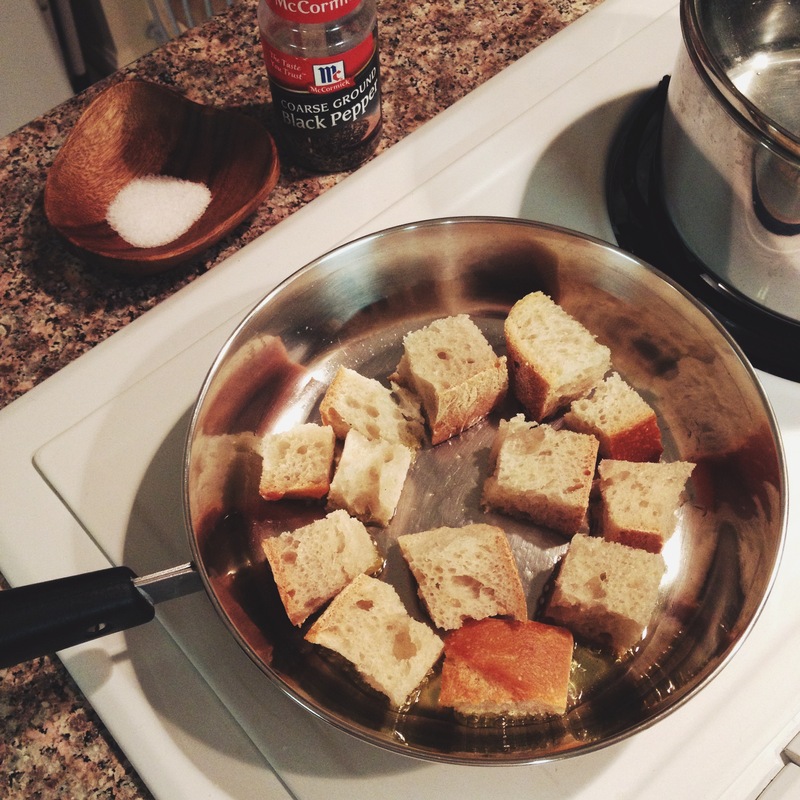 Over medium heat sauté the bread cube, tossing frequently to make sure all sides are nicely browned. This should take around 10 minutes. Work in batches if needed. Add more olive oil if needed and sprinkle with a pinch or two of salt and pepper once they’re ready to be served. Place the croutons on a serving platter. *Slice the chicken and place that plus pan juices over the croutons. Serve warm. 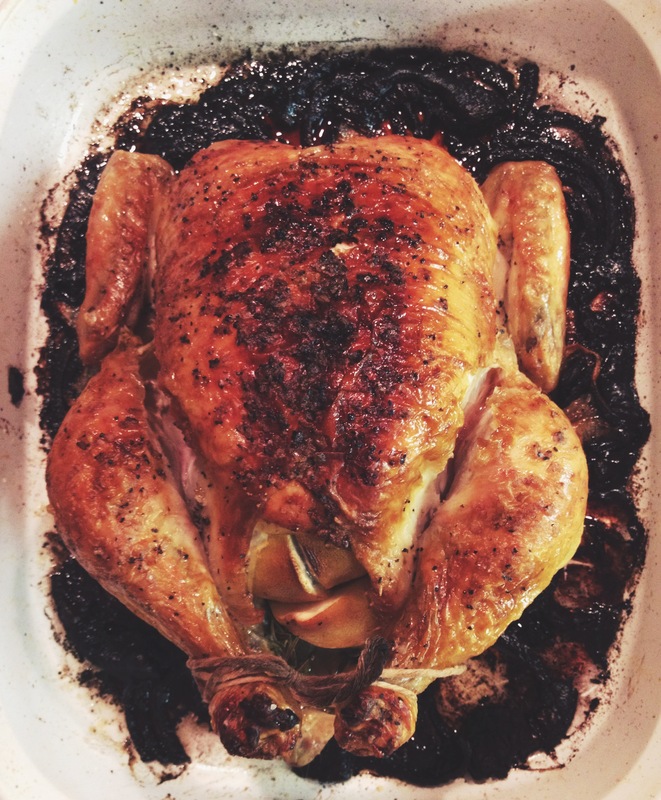 *To see Ina’s tip for a basic roast chicken, such as trusing and carving, see this video. How did Menzie rate the meal? 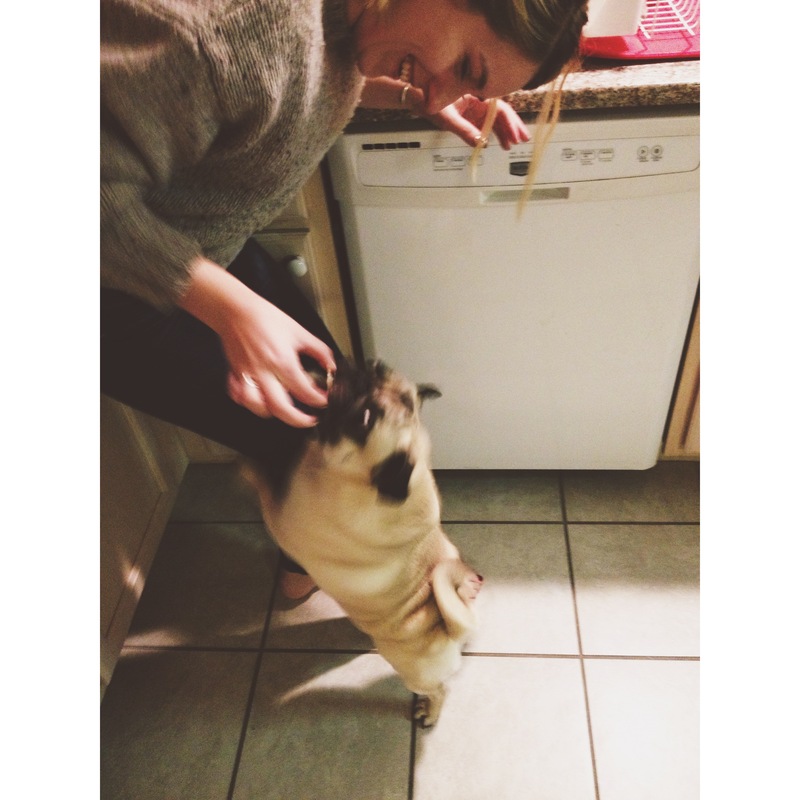 Not validated unless it has a pug’s stamp of approval!